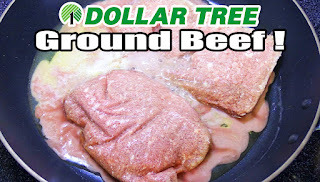 The Wolfe Pit: Uh Oh......Dollar Tree sells Ground Beef! Uh Oh......Dollar Tree sells Ground Beef! Watch and see if $1.00 Ground Beef is any good! Larry, please keep up with getting America to ask themselves, 'What are we eating?' Thank you. -Joe Moitozo, Jr., loyal WAWE? viewer from California.